Joseph Melville, John Herman and Anna Vail met each other at a meeting of the "Get Acquainted Club," at 1026 Wall St., a few blocks south of downtown Los Angeles. As its name suggests, the club was a place for single people to gather for social activities, to meet new friends, and perhaps spark a romance. Melville, a waiter, and Herman, a plumber, were both interested in pursuing a relationship with Vail. Vail was equally interested in Herman, but she wanted nothing to do with Melville, who had asked Vail to marry him, but she turned him down. The spurned waiter became angry, and reportedly threatened to kill both Vail and Herman. On the evening of Sept. 23, 1914, Herman was visiting Vail at her home at 129 Carr St., near the intersection of Main Street and Pico Boulevard. Vail had told Herman of Melville's threats and that she was afraid of him. When Melville came to Vail's home, Herman told him to leave. Herman was also carrying a gun, so perhaps his warning to Melville was more direct and persuasive. Melville left the house, and found 24-year-old Officer Robert Vernon Murray walking his beat in the neighborhood. Murray had been a member of the LAPD for only five weeks, and was newly married. That afternoon, Murray and his wife had been out shopping for furniture for their new home. Melville told Murray that Herman had just threatened to kill him, and he accompanied Murray back to the house on Carr Street. Murray attempted to enter the house through the front door, but was unsuccessful, so he went around to a window at the rear of the building. Murray shone his flashlight through the window, and announced to Herman that he was under arrest for threatening Melville. In response, Herman fired a shot at the figure in the window, hitting Murray in the abdomen. The bullet lodged in Murray's spine, leaving him paralyzed. After the shooting, Herman ran out of the house with the revolver in his hand, and headed north on Main Street, toward his home at 824 S. Main St. Responding police officers caught up to him at Main and Ninth streets, where Herman surrendered and was arrested. Murray was taken to the Georgia Street Receiving Hospital, where he died early the next morning, with his wife at his bedside. He was buried at Rosedale Cemetery (now Angelus Rosedale Cemetery). 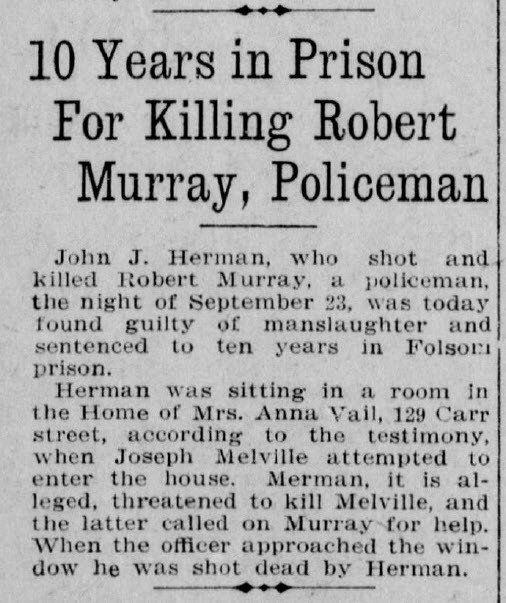 Murray was born July 14, 1890, in Nebraska, and joined the LAPD on Aug. 21, 1914. 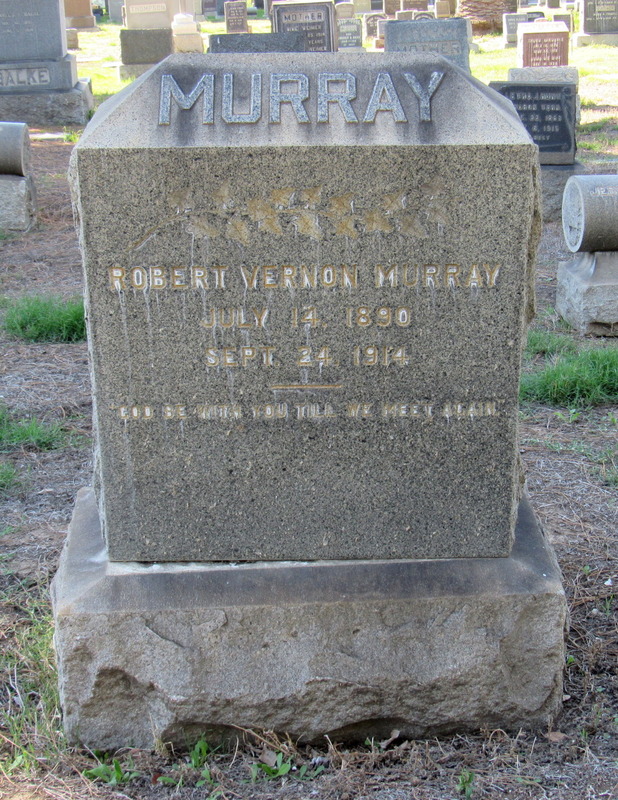 Murray was the 10th LAPD officer to die in the line of duty. Herman was charged with murder in the officer's death. At trial, both Herman and Vail testified that Melville had come to Vail's home and attempted to enter through the window, and Herman chased him away. A short time later, someone opened the window and pointed a gun inside. Herman, thinking it was Melville, fired a shot at the figure, which turned out to be Murray. Herman was found guilty of manslaughter in December 1914 and sentenced to 10 years in prison. He was initially sent to Folsom State Prison, then transferred to San Quentin State Prison in December 1915. He died in the San Quentin hospital on Feb. 25, 1916, at the age of 32. Officer Murray's sign is at the southeast corner of North Broadway and Sichel Street, although that location is likely an error. The sign is about two miles northeast of downtown Los Angeles, and about a block away from Carr Lane. The shooting, however, took place on Carr Street, south of downtown. Carr Street has since been renamed West 14th Place.